Fancy a private resort near Marbella where to play paintball, in pure privacy and in full nature ? Look no further ! We organize private parties (birthdays, staff parties, stag and hen do's, corporate events, etc) in this private venue where you will be able to enjoy many adventure activities. Our instructors will provide you with all the information needs and with protection gear (goggles, dress, gloves, etc). 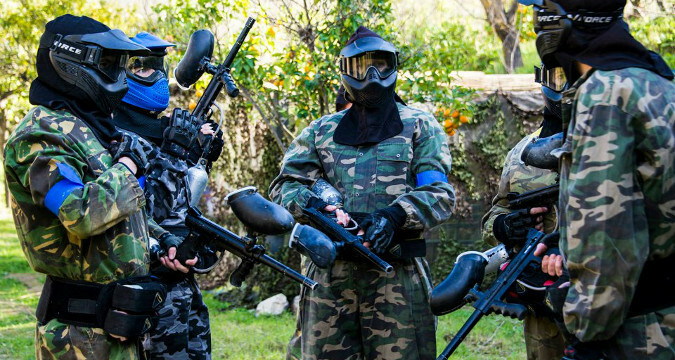 For larger groups, the paintball experience can be combined with additonal optional activities, like quadbike (tours, or circuit if you do not have a license), barbecue or full catering services, off-road segway circuits, cocktail making courses, go ape, ziplines, etc. Our new paintball resort is perfect for any group looking to spend a day of outdoor adventures : staff parties, hen and stag activities, team building events, incentive trips, anniversaries, etc.